New Homeowners: Are You Ready for Central A/C Maintenance? Don’t let A/C problems ruin your new homeowner experience. Follow these tips to perform a visual inspection and learn what you can fix and when you need to call a pro. a. Be clean and free of obstructions; it shouldn’t be covered in any dirt or debris, such as leaves and grass clippings. b. Be level on the ground. c. Have at least 2 feet of clearance around it. d. Have insulation around the refrigerant lines that isn’t torn or compromised in any way. 2. Then, move inside. The vents should have noticeably cold air blowing out of them, and you shouldn’t hear any strange noises coming from the system. 1. Turn off all power to the unit. That includes turning off power at the breaker box, as well as at the exterior shut-off box near the unit, if applicable. 2. Fix inspection issues. If you noticed that the outside unit needs to be cleaned, you can remove the fan cage at the top of the unit with a screwdriver or wrench and remove the leaves and debris using your hands or a wet/dry vacuum. Then, using a garden hose (NOT a pressure washer), spray the unit from the inside out. If you notice that any of the “fins” surrounding the unit are bent, carefully straighten them with a butter knife. Likewise, make any other necessary changes to ensure the unit is level with the proper clearance and insulation around the refrigerant lines. 3. Check the outside fan blades and wiring. Remove the fan cage at the top of the outside unit, if you haven’t already, and examine the fan blades for any cracks or chips. Likewise, remove the access panel on the unit to check the wiring for any signs of overheating, which includes melted insulation on the wires and blackened or burned-looking wires. 4. 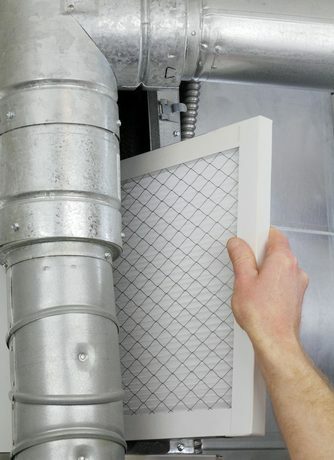 Change the air filter. 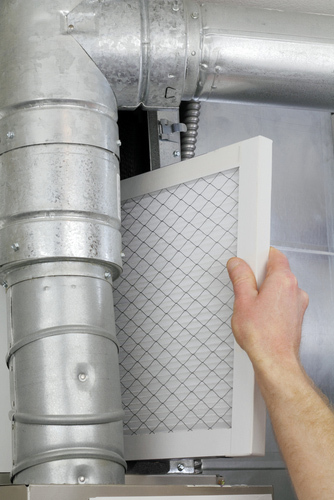 If you haven’t done it recently, follow the manufacturer’s instructions for switching out the air filter. This should be done every one to three months, for optimal efficiency. 5. Examine your thermostat. At this point, it’s safe to turn the power to the unit back on. Then, over the next few days, check to make sure your thermostat is working properly by keeping your home at the right temperature. If you’re not already, protect your new home — and budget — from the inevitable A/C system component repairs with an American Home Shield home warranty.